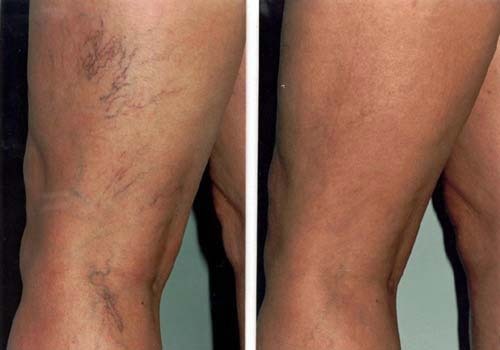 This procedure is used to eliminate spider veins and smaller varicose veins, both cosmetically and symptomatically. With very few potential side-effects and a high success rate, sclerotherapy is becoming a popular option in the treatment for these vascular disorders. An initial consultation is used to determine if the patient is eligible for the procedure. An ultrasound machine is used to create an image of the vascular system in the area, allowing the doctor to determine which blood vessels are causing the varicose and spider veins. The root cause of the issues must be treated first to prevent other vascular issues from developing after these are treated. If the patient is a good candidate for the procedure, an appointment is scheduled. The sclerotherapy procedure itself can be performed in the doctor's office, and requires no anesthesia or numbing agents. The patient is asked to lie on a table with the spider or varicose vein facing upwards. An injection of scarring solution is made in the vein. This scarring solution causes large amount of scar tissue to develop inside the vein, leading to the cessation of blood flow through that particular vessel. The injection itself is no more serious than a standard shot, and can normally be performed in just a few seconds. Depending on the size of the area being treated, multiple injections can be performed in one session. Following this, the procedure is complete. After the scar tissue develops and the blood flow stops through that blood vessel, the body's natural immune system starts to break down the problem vein, eliminating its appearance on the body. The symptoms caused by the spider or varicose vein will stop as soon as the blood is prevented from flowing through the vessel. The procedure has around a 90 percent success rate, but many cases will require multiple injections, with results improving with each new injection. On average, sclerotherapy sessions only last 45 minutes, and normal activities can be resumed the same day. There is no scarring since the only trauma to the body is an injection point, and side effects are rare. While they are rare, three main side effects can develop from sclerotherapy. A discoloration of the skin in the area of the treatment. This is caused by an incomplete absorption by the body. The potential for a reaction to the sclering solution can occur, but it is extremely rare.